It's a challenge for me to be creative. Some people can naturally come up with magical, surprising, clever, and innovative concoctions as well as amazing execution and presentation of said concoctions, but not this gal. I need to be prompted. To make matters worse, I get bored easily--I like a little variation in the things I bake. So it's a vicious cycle--I want to make and eat new combinations of flavors, but I can't come up with them. Vicious, I tell you. My latest inspiration came in the form of some primordial ancient archaic old caramel dipping sauce lingering in the deep recesses of the fridge. What to do with this thickened and gloppy goop? I daren't actually use it as a dip--that'd be just asking for trouble. I opted for mixing it into a muffin batter, as I'm wont to do. These turned out better than I ever could've hoped. 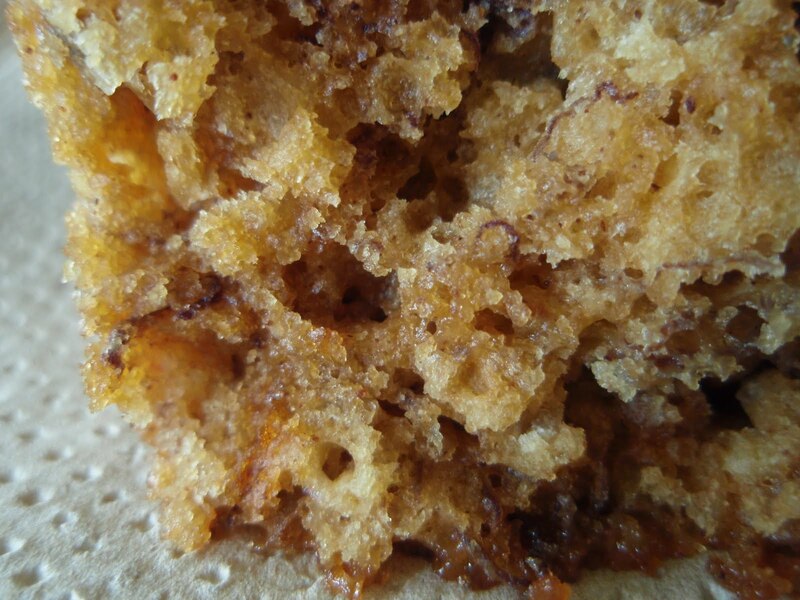 There was just enough caramel flavor to be detectable, and the crumb was moist yet cohesive. I got some rave reviews from a couple of handfood connoisseurs, so I think I might be on to something with this use for aged caramel dipping sauce. The only problem is that I have to wait another year or two for a tub to reach the ideal point of almost-rankness. Lightly grease a muffin, mini-loaf, or 9x5-inch loaf pan. In a large bowl, combine the flour, baking soda, and salt. In a separate bowl, stir together the melted butter and sugar. Stir in the eggs, caramel, mashed bananas, and vanilla until well-blended. Stir this banana mixture into the flour mixture; stir just to moisten. Fold in the pecans and pour or spoon the batter into prepared pan. Bake for 18-20 minutes for muffins, 25-30 minutes for mini-loaves, or 60-70 minutes for a large loaf, or until a toothpick inserted into center of the loaf comes out clean. You always have such great ideas! It's so great that you managed to salvage something from the fridge. Had I read this last week I wouldn't have thrown out the caramel sauce in the back of my fridge! The main problem I have with those ancient jars in the back of the fridge, is they have often lost their labels! So kudos for finding one that you actually KNEW what it was and then putting it to such good use, Grace. I aspire to be a handfood connoisseur and taste test all your creations. I love all things caramel-ly!! Though I never have any hanging out in the fridge, it's gone as soon as I make it! Ha, your can-do spirit is inspiring. I am all about experimenting with "leftovers." What doesn't kill you makes you a better cook, am I right?! Am I missing something? When do you add the caramel sauce? To the batter or drizzled on top after baking? And, I get bored eaily too! haha.. This bread looks so smooth and scrumptious! That carame sauce is a great addition. Great way to jazz up those banana muffins! Now, I think mixing leftovers into a batter is quite innovative! I wouldn't have thought of it! Looks delightful! Now I'm kicking myself for throwing out some old caramel sauce just recently. Banana bread is a perfect place for it. Sounds great with the pecans too! I love not wasting food, this is a great innovative recipe to dress up boring banana bread. This is just my kinda bake... well done indeed. Looks so good! Love the caramel in there! Often the best baking is the using up of things to make something new. This looks delicious! If it's banana bread, I'm all for it. Caramel is just a huge added bonus. I was just thinking I wanted to bake a loaf of something tonight...and now this? Oh, Grace. You must be telepathic! I'm all about the caramel-banana taste. Grace...did you just mention CARAMEL...next to chocolate...it's hands down my favourite sweet flavour. I think the bananas in my fridge mean this is destiny. That crumb looks perrrrrfect. I love banana and caramel together. Definitely a cake that makes you lick your fingers after you take a bite! What I would give for a thick slice of this bread right now. You crack me up! Looks yummy and I do believe I have a tub of old Caramel in my fridge from something! 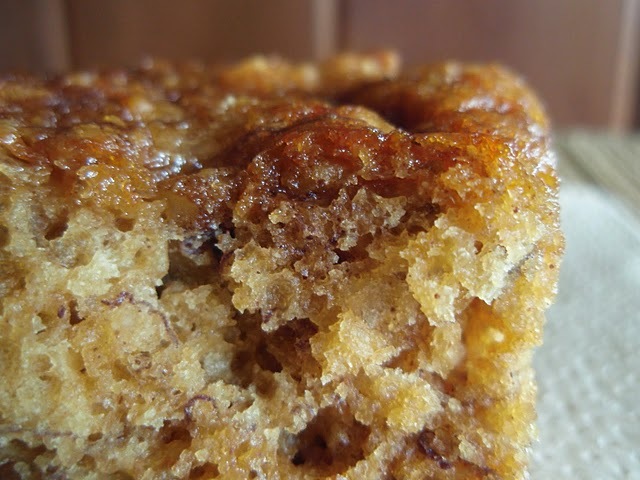 Caramel banana bread?! What a fabulous idea! This looks terrific. Genius, I tell you, sheer genius! And here I am with bananas browning on the counter. Thank you! I love your ideas! and I'm so jealous with the textures of your cakes! thats always the problem I have when I make something out of product thats on its last leg..It comes out so good that everyone wants it again....well it looks absolutely delicious....so you might have to try it again with new caramel....maybe add a shot of bourbon to help age it! You are absolutely creative with your recipes! Look at this beautiful quick bread. I am a caramel lover as well so this tops my list on all fronts. Nice work! Ah ha! My son was just asking me to make him some banana bread and I was thinking about adding some dulce de leche. So we are thinking alike right?! Hmm so what you're saying is that I need to go out right now and buy some caramel and let it FERMENT before I throw it into this banana bread? Oy. I don't know if I can wait that long! It looks amazing. I love creative uses for old ingredients, especially to save them from the trash. This looks so good I might even use fresh caramel sauce or even make my own for it. Yum! This recipe is a good reason to make caramel sauce. Dude, caramel in bread. YES. What a creative way to use the caramel. Yum! I have always wanted to be creative too. Although I think you are plenty creative :) Now. Caramel in bread. Awesome! I would loooooove some of this right now. I'm starving! ha! awesome use of caramel sauce and great post - I loved clicking through all of your links. i love making new food recipes. mostly my cravings take over and viola i have a creation or a diaster. as far as you, you are far too hard on yourself. i think you are very creative. i mean look at all the sweet and salty recipes you've come up with? hello? Oh, grace - you make me laugh! Congratulations for saving the poor old caramel from complete caramel death (I think death for food is any morsel landing in the garbage rather than a tummy!). This looks delicious! I seriously said the same thing about myself, although not quite as eloquently as you! Yum-caramel and a spoon is all I need! I love it when I can use up something old and turn it into something new and delicious! So satisfying! And I pretty much like caramel anything, so nice job all around. Anything with caramel is a winner in my book. why do you always have to take such great closeup photos of your goodies? it's like taking a microscope to look at the lovely nooks and crannies of the dessert before digging in. so delish. I so love your close ups on food,...especially on your own baked goods,...drool,..drool,..drool,..and so easy to make too! A divine cake with all of that caramel! You always have great ideas and this one is no exception and is so perfect for using up that very last bit of caramel at the bottom of the jar! You, uncreative? I'm just going to blame that crazy talk on a case of too much caramel. Not that you can ever have too much caramel in banana bread. IN banana bread! Wowza. Aged caramel sauce - LOL! That's hilarious - like wine, the older it is the better it tastes? ?